Early Life: Julia Ward Howe was born May 27, 1819 in New York City. She was the fourth of seven children born to a Wall Street stockbroker, Samuel Ward III and his wife, occasional poet Julia Rush Cutler. On her father’s side she was descended from Roger Williams and two governors of Rhode Island. Her mother was the great grand niece of Revolutionary War legend Francis Marion (nicknamed “The Swamp Fox”). Julia Ward’s family was an upper middle-class family. When Julia was five, her mother died of tuberculosis. Samuel Ward’s concern for the welfare of his children was often overpowering. Julia was from the first an intelligent and inquisitive child. She educated herself and became a formidable intellect in a time when women were very limited in their educational endeavors. Julia was educated by private tutors and in schools for young ladies until she was sixteen. Also, thanks to her older brother’s travels in Europe, she possessed a private library of modern works, many contradicting the Calvinistic world view presented by her father. Due to these circumstances Julia was able to become very well-read and frighteningly intelligent. These circumstances conflicted Julia’s love for her father and her ambitions as a writer, a thinker and an individual. Julia, though limited by her father, was as much a social butterfly as she was a scholar, and due to her father’s status as a successful banker, she was brought into contact with some of the greatest minds of her time. She interacted with Charles Dickens, Charles Sumner, and Margaret Fuller to name a few. Her brother Sam married into the Astor family, which was highly prominent at the time, allowing him great social freedom that he brought Julia into. Nevertheless, Julia and her sisters were cast into mourning time and again. Their father died in 1839. Shortly after her father’s death, Julia’s brother and sister-in-law also died, along with their newborn child. Not long after this, in April of 1843, Julia met and quickly married Samuel Gridley Howe, himself famous for his work on behalf of the Greek Revolution, for his reform work for prisoners, and his efforts in education for the blind. Life certainly would have turned out differently had Julia’s parents lived to see her married. And only she could know whether all of the tragedy and confusion in her family caused her to marry someone more quickly than she otherwise would have. However, by summer of that year the newlyweds were embarked on a wedding trip to Europe accompanied by Julia’s youngest sister Annie. She gave birth to her first child while honeymooning in Europe, eleven months later. Much current scholarship is devoted to the analysis of the couple’s well-documented and tumultuous relationship. Julia grew from being a coddled and cared-for, yet independent-minded New York heiress, into a wife and mother living in the remote, isolated quarters of the Perkins’ Institute for the Blind, in Watertown, Massachusetts (outside Boston), where her husband was engaged with his teaching and philanthropy. 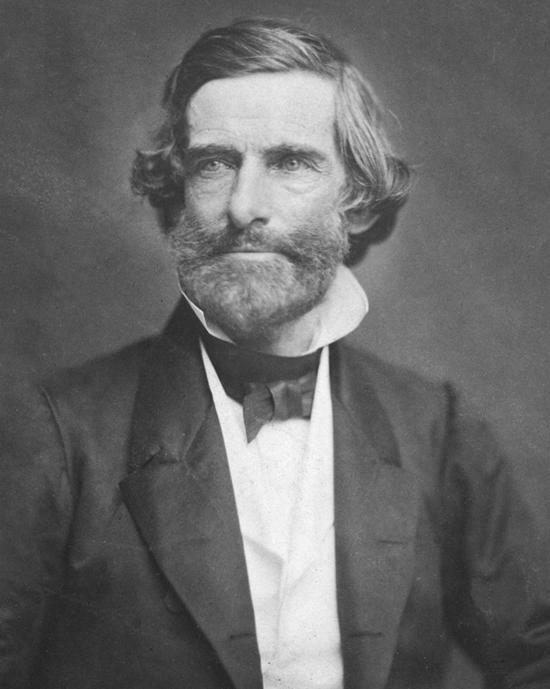 Samuel Gridley Howe was twenty years older than his young wife, and upon their marriage (and against the protestations of Julia’s family), he took charge of the income received from her large estate. Julia was not to have charge of her economic affairs until her husband died in 1876. At that point, though, due to a series of bad investments by both her husband and her uncle and brothers, much of the money was spent. Julia found herself a widow with a very meager income. Trouble between Sam and Julia continued to escalate, and in 1852 the couple separated. Julia and her two youngest children stayed with her sister in Rome while her two eldest daughters remained in Boston with their father. During this period a family dynamic emerged between the couple and their children that would remain throughout their lives. Her book Passion-Flowers was published in December 1853. The book collected intensely personal poems and was written without the awareness of her husband, who was then editing the Free Soil newspaper The Commonwealth. Her second anonymous collection, Words for the Hour, appeared in 1857.‪ She went on to write plays such as Leonora, The World’s Own, and Hippolytus. These works, all contained allusions to her stultifying marriage. Julia’s being a published author troubled Samuel greatly, especially due to the fact that her poems many times had to do with critiques of women’s roles as wives, her own marriage, and women’s place in society. Julia Howe bore her sixth and last child in 1858 at the age of forty. Social Activism: Julia Ward Howe was inspired to write “ The Battle Hymn of the Republic” after she and her husband visited Washington, D.C. and met Abraham Lincoln at the White House in November 1861. During the trip, her friend James Freeman Clarke suggested she write new words to the song “John Brown’s Body,” which she did on November 19.‪ The song was set to William Steffe’s already-existing music and Howe’s version was first published in the Atlantic Monthly in February 1862. It quickly became one of the most popular songs of the Union during the American Civil War. Now that Julia Howe was in the public eye, she produced eleven issues of the literary magazine, Northern Lights, in 1867. That same year she wrote about her travels to Europe in From the Oak to the Olive. After the war she focused her activities on the causes of pacifism and woman’s suffrage. By 1868, Julia’s husband no longer opposed her involvement in public life, so Julia decided to become active in social reform.‪ She helped found the New England Women’s Club and the New England Woman Suffrage Association. She served as president for nine years beginning in 1868.‪ In 1869, she became co-leader with Lucy Stone of the American Woman Suffrage Association. Then, in 1870, she became president of the New England Women’s Club. After her husband’s death in 1876, she focused more on her interests in reform. She was the founder and from 1876 to 1897 president of the Association of American Women, which advocated for women’s education. Julia became very involved in the reform movement and supported issues like abolition, women’s rights, prison reform and education. She developed close friendships with members of the Boston intellectual elite — William Ellery Channing, Thomas Wentworth Higginson, and Theodore Parker. Despite his objections to Julia’s working outside the home, Sam relied heavily on his wife as editor and writer for his newspaper, “The Commonwealth.” This short-lived venture was seen by many as incendiary propaganda for the abolition movement. As the Civil War approached, Howe became heavily involved in the funding of John Brown’s revolution. When John Brown was captured, Sam fled to Canada to avoid prosecution as a collaborator. An excellent history of this period, and his involvement, can be found in the book, “The Secret Six,” by Edward Renahan. While Sam objected to Julia’s work, he did not always stop her from attending to it; and while Julia was prevented from attending to some of the work she wished to engage in, she managed to free herself from her husband’s demands and secure her own interests. She was fluent in seven languages and a serious scholar of philosophy. When her poem, the “Battle Hymn of the Republic,” was published in 1861, it brought her instant celebrity, and the song would make her one of the most famous women in 19th century America. Julia continued her study and work for reform. Woman’s Suffrage was the cause she was most involved in and she began to be known for her strong and outspoken views. Julia was the mother of seven children, one of whom, Sam Jr., died during infancy. Her marriage had now settled into a workable arrangement. Her fame brought her even more autonomy, and her ambitions were beginning to be realized. By the time her husband died in 1876, she had established a career for herself as a preacher, a reformer, a writer and a poet. In the first journal entry after her husband’s death Julia wrote, “Start my new life today,” and indeed she did. For the next forty some years she was a strong force. She answered to no one except herself and God. Julia traveled the world promoting Women’s Rights, Peace, Prison and Education Reform as a preacher, lecturer and dignitary. She was seen as a bridge between Society and Reform and used her celebrity and social status to further her ideology. She was also co-editor and writer for The Woman’s Journal, which lobbied for suffrage and human rights. She was instrumental in creating Mother’s Day, which she envisioned as a day of solemn council where women from all over the world could meet to discuss the means whereby to achieve world peace. They would also convene as mothers, keeping in mind the duty of protecting their children. She became the first woman elected to the Society of Arts and Letters, and the biography of her, written by her children, won the Pulitzer Prize. In addition to her reform work, Julia Ward Howe wrote travel books, children’s fiction and music. Oscar Wilde paid her a visit in Newport. William Dean Howell’s regretted not knowing her better. Emerson wished she were from Boston. And Samuel Clemens was a cohort and friend. Julia Ward Howe’s letters and diaries read like a who’s-who of 19th century history, and her ideas are as pertinent today as they were during her own lifetime. On January 28, 1908, at age 88, Howe became the first woman elected to the American Academy of Arts and Letters. Howe was inducted posthumously into the Songwriters Hall of Fame in 1970. 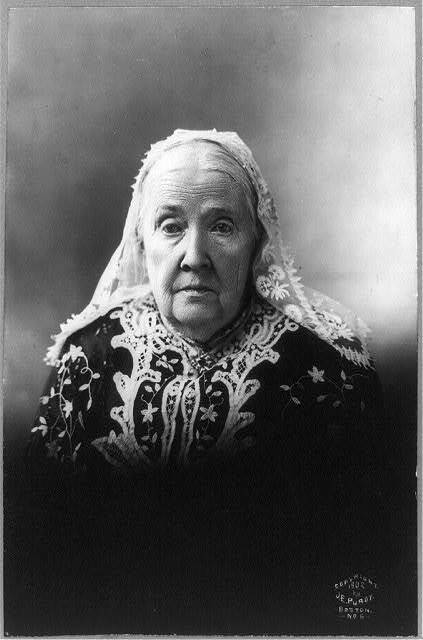 Julia Ward Howe died in Newport, Rhode Island on October 17, 1910. Julia Ward Howe has been honored by the U.S. Postal Service with a 14¢ Great Americans series postage stamp issued in 1987.